Vickerman, born in Cape Town and a former South Africa U21 international, made his Super 12 bow with the Brumbies after making the move to Australia prior to the 2001 season. International honours with Australia 'A' arrived in 2002 before a Test debut against France later that season. 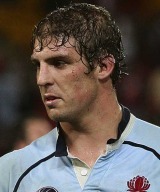 A strong lineout forward, Vickerman became a regular in the international setup and made the switch to the Waratahs in 2004. He played at his second Rugby World Cup in 2007 before withdrawing from the international stage in 2008. He moved to England to study at Cambridge, playing in two Varsity matches and captaining a victorious side in 2009. Vickerman combined his studies at Cambridge with appearing for the Saints, though he was restricted to just a handful of appearances for the Northampton side - registering just four appearances for the Premiership side. Vickerman then arrived back in Australia for the last couple of weeks of the 2011 Super Rugby season making his first appearance in a Waratahs shirt for a number of years in their final two matches of the campaign. Vickerman clearly did enough to impress Wallabies coach Robbie Deans and he was recalled to the squad for their Test against Samoa. Despite the match ending in defeat, Vickerman found himself back in the Wallabies mix in their Test against New Zealand. Vickerman will hope to add to his Wallabies caps having been named in Deans' 30-man squad for the World Cup.